Outdoor events can be beautiful. They provide a natural decor with the outdoor as the scenery. They allow guests to mingle with one another outdoors. The fresh air of the day can be very relaxing and invigorating. Many people enjoy attending outdoor events, when the weather is nice. However, weather is not always very predictable. Poor weather can ruin an outdoor event. Extreme heat can make the guests very uncomfortable. Cold weather can prevent guests from even wanting to attend the event. However, tented events can help to control the weather of the day. Those planning an outdoor event can provide their guests with shelter in the event of increment weather. They still have views and easy access to the outdoor area. The tented events can even be customized as to how much shelter is provided, depending on the weather of the day. There are different types of tents available. Tents are often made of different materials for different looks and different weather conditions. A wedding will often go with something classier and that provides more shelter, in the event of high rain or wind. A simple backyard party tent might provide less shelter, simply acting as a sunscreen for the guests. When it comes to tops, there are two main types available, polyester and vinyl. Here, though, your options are going to be dictated by the kind of party tent you choose. In some instances, you may not have any choice about the material your top is made of. At the same time, almost all large event tents are made of vinyl. It is durable, affordable and strong. 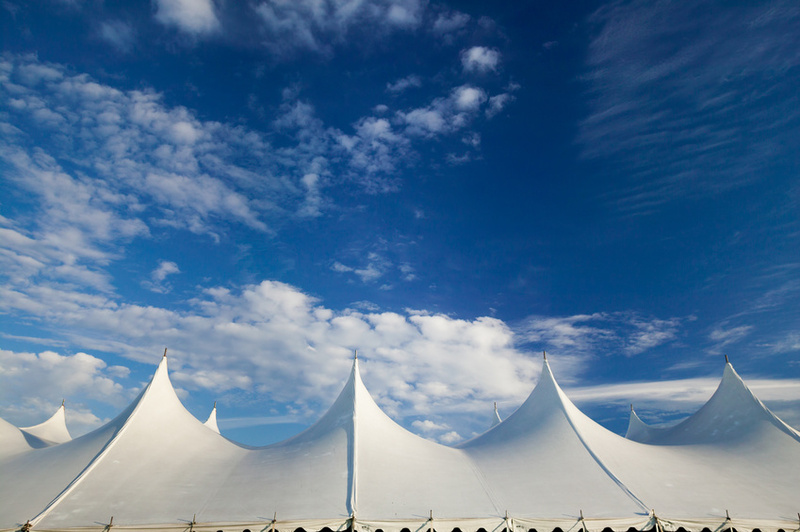 A few things need to be kept in mind when planning tented events. You will likely be renting the tents and any tables and chairs that come along with it. You will need to carefully plan out the needed items for your day. Again, this will likely depend on the type of event that you are planning. A backyard party may be more simply, with a few tables, a few chairs and a smaller tent. An outdoor wedding, however, will probably require more chairs and longer tables. There will need to be spacing available for a dance floor as well. Tented events should be carefully planned to ensure that you have enough space for all of your event needs. For example, if you are hosting a speech or another type of event where your chairs are going to be lined up in rows, it is a good idea to allow 5 or 6 square feet per chair. Be sure to keep in mind, though, that if you are using particularly bulky chairs or have guests that require more space to maneuver, you are going to need more space. If the event will include food, you may also need additional space. The layout of the food will also factor into the size of the tent needed. If you are planning to serve a meal, the amount of room you will need will largely depend on the dimensions of the tables you choose as well as the number of people that will be seating at each one. Try to allow at least 12 square feet per person when using round tables and 10 square feet when using rectangular ones. Most tented events will provide consultation to ensure that you choose the appropriate party tents for rent. When you rent a tent for a wedding, it is always a good idea to double check and to provide a suggested layout to the party rentals company. Planning any event requires a lot of preparation. Outdoor weddings may require even more planning, as the weather conditions are often unpredictable. Renting wedding tents can make the weather less important. Guests will have shelter in the event of increment weather. They will also be covered from extreme heat and cold weather. Rented tents can also be large enough to include things like the dance floor, the food area and the seating area for all of the guests. It is important to carefully plan the measurements of each area to ensure that you will have enough room for everyone.